Thumper from Drool is a hard game to describe. The developer calls it a rhythm violence game, but I look at it as a psychotic merging of Rex and Audiosurf with the stylings of Tron. The game is out now for PSVR and plain old 2D on a regular screen and it is a hell of a ride in any format. Drool has announced that HTC Vive and Oculus Rift support will be coming later this year as well. 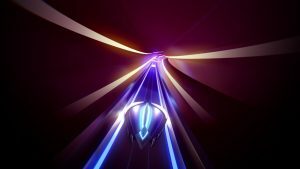 I had experienced Thumper before at PAX East where I was lucky enough to try an extended playthrough on the PSVR hardware. This time I played through the frenetic levels in 2D to see if the game is as much fun without the VR experience and I can easily say it is still very enjoyable because of how frantic and aurally strong it is. 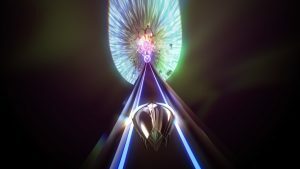 In Thumper I controlled a sleek ship resembling a metallic bug as it zoomed and twisted through insane kaleidoscopic backgrounds trying to reach the end of each themed level where a boss awaits. The term “a rhythm violence game” means there is music, but not music you could identify. It is a beautifully atmospheric and frenetic blend of notes drawing inspiration from Nine Inch Nails, Underworld, Daft Punk and other rattling techno-driven bands. The result is a flowing soundtrack that is dynamic without being overwhelming. As you play you contribute to the beats by hitting the button commands exactly right, adding a cadence to the music that becomes hypnotic and addictive. As levels progress and get faster and more violent the music keeps up, with faster and more chaotic beats pulling you along for the ride. Gameplay is pretty basic at its core (remember they want this to be primarily played on VR). In order to progress I needed to hit a button at the right time to activate a pulse; I also needed to hold down a button while turning and when passing through gates. It is all so simple, and in theory I could get to the boss battle just by holding down that one button and moving in the right directions, then hitting said button with the correct timing to defeat the boss, but that would be missing all the nuance of the game. Releasing and tapping the button gave me new pulses of sound, refreshed my shield and added to the chaotic cadence of the music. As I played the game became faster and more winding as the levels grew deeper and more colorful with added tactics thrown in. The boss fights are pretty much the same: Hit the button at the right time, hit turns and gate crashes perfectly, and then take out the enemy with four perfectly timed pulses. It seems simple (and at its heart it is) but it’s far more satisfying then it sounds when the lights, sounds and beats are encasing you as you play through the levels. To illustrate the action of the game and how it ramps up I recorded a Lets Play on my channel (Dad Plays Games at Lunch) showing how the action and sound ramps up across the levels. I typically do not care about scoreboards and rankings but I relished every time I scored an A and was thrilled when I managed to nail an S ranking when I hit everything perfectly. A video is the best way to learn about the game as it perfectly shows Thumper‘s excellent sound and visual design. 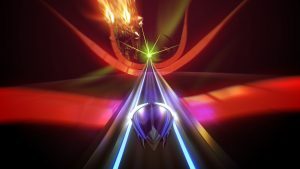 Thumper as you can see if a kaleidoscope of color, sound and action that is hypnotic and thrilling on a 2D playing field, is even better in 3D, and is a game anyone getting PSVR should play as soon as they set up their system. This is a game that is just plain fun to play while being challenging and downright nefarious at times. That is a rare thing to experience in a videogame and I loved every minute of it.